The victim was completely restrained and tied to the ground or any horizontal surface. 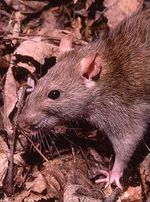 A rat was then placed on his stomach covered by a metallic container. As the container was gradually heated, the rat began to look for a way out - through the victim's body. Digging a hole usually took a few hours of agonizing pain for the victim. This almost invariantly resulted in death.